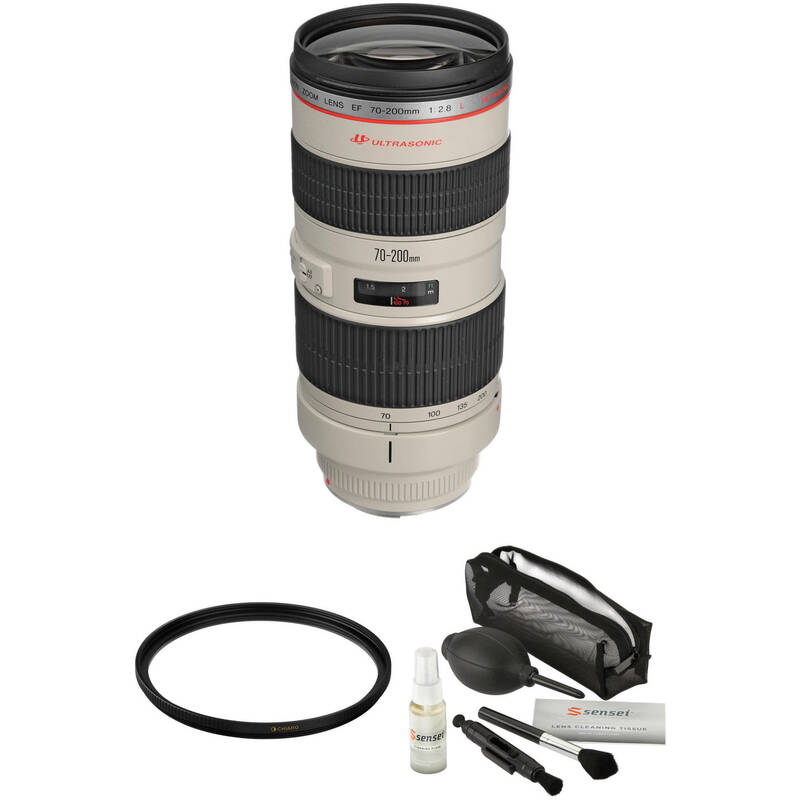 Rounding out your kit, the Canon EF 70-200mm f/2.8L USM Lens with Accessories Kit from B&H bundles the telephoto zoom lens with 77mm circular polarizer and UV filters as well as a lens cleaning kit. EF 70-200mm f/2.8L USM Lens is rated 4.8 out of 5 by 818. Rated 5 out of 5 by PCPHOTO from VERY SHARP PROBLEM SOLVER Having owned 4 different Canon 70-200L zoom lenses, this one is the best yet! I was very dissapointed with the series I f/2.8 IS lens wide open, and I ended up purchasing 3 "L" primes in its range to obtain sharp photographs in dim light. That all changed using this new version. The generation II f/2.8L lens offers even better performance than the f/4L IS version, (which is excellent, but a bit too slow for available light photography) and is much more effective than my non IS "L" primes in this range due to its awesome image stabilizer unit. What a problem solver! Wedding/portrait photography for me will never be the same. Highly recommmend! Rated 5 out of 5 by Roman L from Get This lens and you will be happy!!!! Such amazing lens i love the sharpness i tried to compare two lenses F2.8 and F4 and to tell you the truth F4 have much sharper images! perfect for portrait nature and any kind of photography!!! weights 3 times less then 2.8 and gives you much more than 2.8. less expensive and sharper!!! IS works amazingly good!! !Autofocus is really fast and lens by itself have metal housing sealed good from dust and water.Comes with case and hood. if you are thinking about purchasing 70-200mm get F4.0!!! i tried both and 4.0 is newer and better!!! By the way in Low light works perfect! add some Iso And You are good!!! TOTALLY LOVE THIS ONE!!! Rated 5 out of 5 by DW from Never fails to impress I've owned this lens for about eight years and have used it for wedding photography, portraits and wildlife (with 2x extender). I've never been disappointed. It's ultra-sharp like a prime lens, even at the zoom extremes. For those who have never used an f/2.8 lens the extra 1-2 stops really make the difference in many situations. I've wondered what it would be like to upgrade to the IS version of this lens but I've never seriously been tempted as this is such a fabulous lens in its own right. It's also a bit of a 'backstage pass' - when you carry this lens with hood attached, people are so in awe they let you go wherever you want! Rated 5 out of 5 by Sifu from More impressed every day I have had this lens for around 4 months now and I am more and more impressed with it all the time. Image quality is supurb. Auto focus is great, I can shoot through trees to a subject that is moving and nail it consistantly. I took some shots of cars coming straight at me doing around 50 and it consistantly nailed the focus using AI Servo. It produces and pleasing bokeh. I use it for weddings, protraits, landscape and street photography and it consistantly produces great results under varied conditions. A number of people say it is too heavy, yeah there is some weight to it but it feels just right to me, I like the weight, it just feels good. Rated 5 out of 5 by khanh from Excellent lens! I waffled for a while before deciding to buy this lens. I did a lot of research, read online reviews, weighed the pros and cons, and tried to see if the 24-105L would be "good enough". In the end, lust for the 70-200mm won out, and after using the lens, I have no regrets at all. This lens comfortably outresolves the 24-105L f4 lens that came with the 5D Mark III. The sharpness is amazing, even at f2.8. It is brighter and faster than the 24-105L, obviously. The colors are more accurate and purely "Canon". The "bokeh" and background blur are also much better, so much that portraits make the subjects "pop out". Cons? Size, weight, and cost. Rated 5 out of 5 by news&sportsphotog from Overall a great lens This is the second of this lens I've owned. Personally I find while the IS version may be sharper in places, the non-IS is sharper overall throughout the zoom range. I sold my original to upgrade to the IS and wasn't pleased with sharpness, so sold it and purchased another non-IS and am much more happy with it. Typical L build quality, solid feel, fast and quiet AF and quite durable. My only complaint is the design of the lens hood attachment, a problem I have with most of my L glass - after a while they get loose and won't stay put, but I know I'm tougher on equipment than the average or casual shooter. Rated 5 out of 5 by Flying Scotsman from Worth all the lofty praise? Worth all of the lofty praise? ABSOLUTELY! This truly is photography's Platinum Standard - whether using digital or that old-fashioned stuff, film. I reserve the description "perfect" for almost everything; this lens is a rare exception. No questions whatsoever, absolutely tip-top marks for astonishing clarity, sharpness, colour & contrast; lightning-fast USM auto-focus. On an APS-C (1.6X) sensor body, this shoots like a 112-320mm f/4 lens. It is - basically - a "do it all" telephoto zoom. Considered the f/2.8 version but the added price for the one extra stop just wasn't worth it - to me. The added size & weight was also a factor. Does this lens come with a USA warranty only? The included warranty is USA only, yes. Is this lens ok for the canon 6D? 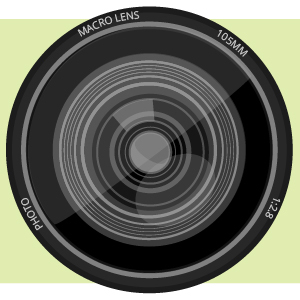 The serial number will be on the barrel of the lens near where you mount the lens to a camera. Does this lens have water and dust resistant sealing? Can I use with my Cannon Rebel t2i? Will this lens mount onto my Sony XDCAM EX3? Which adapter should I use?Thank you. Will this lens work with a Canon Mark 2 camera? Yes it will! I used it on my old Canon 40D until I recently upgraded to the 5D Mark III.